JOHNSTOWN, Pa — Making the transition into junior hockey is never an easy process. The expectations are higher, the competition is tougher, and the margin for error is minimal. Roman Kraemer, a rookie forward for the Johnstown Tomahawks and native of Moon Township, is still trying to find his way in the North American Hockey League. 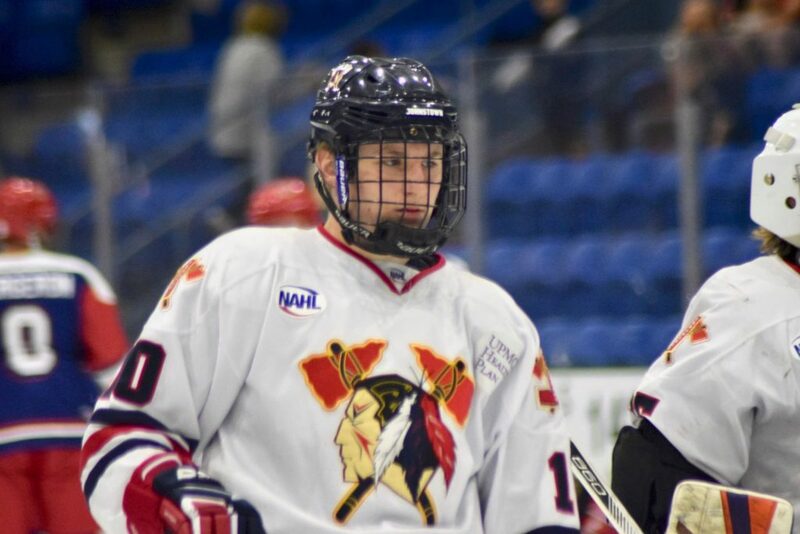 Tomahawks head coach Mike Letizia has been watching Kraemer grow over the early part of the season, and through his observations of the rookie forward, Letizia has been content with what he has seen so far. With the Tomahawks struggling recently, having lost 10 straight games, the team could use some motivation on the offensive side of the game. Through 16 regular season games to date, the club has only been able to produce 28 goals while allowing a league-high 66 goals. Letizia understands that Kraemer is still getting his feet wet and adjusting to junior league hockey. To get the team moving in the right direction, Letizia added, the young forward is going to have to produce even more for the struggling Tomahawks. Although Kraemer has been playing well, he has not been producing as well as his coach would hope to start the season. Scoring only four goals in 16 games in the early stages of the season, the team is going to need more from the Moon Township native. With the Tomahawks looking for a spark in the lineup, Letizia is looking at Kraemer to eventually be a potent goalscorer for the club. Much of the struggle can be credited to the difficult transition to playing in the NAHL. Kraemer blames the tougher competition and lack of weaker competition as a difficult change to become accustomed to. Scoring goals was something that was always easy for Kraemer. Playing with the Pittsburgh Penguins Elite U18 team last season, Kraemer amassed 20 goals in 32 games. While Kraemer has not been scoring goals as much as he would have wanted to, he did add that he has been attempting to use his vision and speed to try to create scoring chances. For most players making the transition to junior hockey, the transition off the ice is almost as difficult as the transition on the ice. Most players are jettisoned to an area they are not familiar with and are away from their families for an extended period of time. Living in Moon Township, which is only a two hour drive from Johnstown, has made the transition much easier for Kraemer. While the proximity to home has been a great advantage to Kraemer, his new home in Johnstown has certainly welcomed him with open arms. Even though the team is sporting a 10 game losing streak, Kraemer was amazed about how supportive this city has been for its hometown Tomahawks.